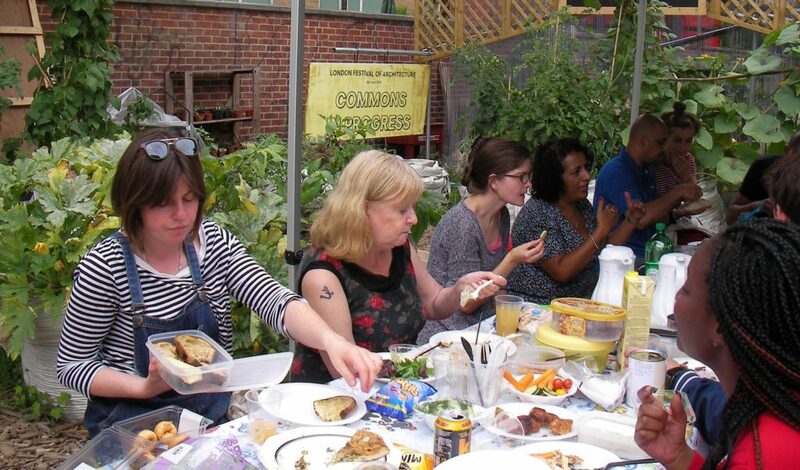 Loughborough Farm is a community food growing project that began in August 2013 and has been growing ever since. The vision was to create a patchwork of community growing spaces on pieces of derelict or underused land. Our main site is on Loughborough Road where we produce food for local consumption and sale throughout the year. We run twice weekly growing sessions and everyone is welcome to join us. We grow food together rather than people having individual plots. Regular volunteers take fresh vegetables home with them after every session. The project’s main focus is on food growing, but there are opportunities to help with other aspects such as DIY, arts and crafts, cooking, community events, selling and planning. You will get the opportunity to learn new skills, free training sessions, a proportion of food grown, the opportunity to meet other local people and benefit your local community. Two of our longstanding volunteer initiated projects include the Wish You Were Here project focussed on wellbeing and the Loughborough Farm Community Café. The café is currently open every Thursday and Friday 11am – 3pm at the Platform, 2 Ridgway Road, SW9 7AH (opposite the Farm). We sell Farm produce and plants at our monthly market stall on the first Saturday of the month. Everyone is welcome, even if you have no growing experience, but children and young people (under 16) must come with a responsible adult. Our sessions are currently on Tuesdays and Saturdays from 1 – 3 pm. You are welcome to come along to any session – you can just come and have a look around or get involved in whatever we’re doing that day. Some people attend regularly and others just come occasionally.